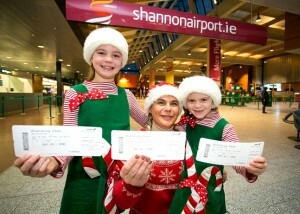 Santa’s busiest annual day in the region – short of December 25th itself – is already on the arrival and departure’s board at Shannon Airport, with confirmation this week that the Santa Flights are set to return next month. Saturday and Sunday, December 3rd and 4th, have been announced by the airport as the day it will put on what has become the biggest children’s treat in the region in the build up to Christmas Day. Now in its fourth year, this year’s Santa flights will see Shannon Airport treat over 2,000 in total, comprising children and guardians, to the magical moment in the sky when they get to meet with the big man himself on board a 737 flight some 15,000ft above sea level. This year again Shannon Airport will donate proceeds from the nominal €9.99 fee to its designated charities, which for 2016 are Galway’s Ábalta Special School for children with autism and complex needs and the Irish Children’s Arthritis Network (iCAN). Seats will also be set aside on flights over the two days for the charity partners. With the demand for the flights set again to significantly exceed seat availability, Shannon Airport will assign the tickets by lottery. Forms can be accessed on the airport website hereand can be submitted up to the deadline of the 9th November. The flights were introduced in 2013 to mark the airport’s first year as an independent entity and act as a thank-you to the region for its support. But such was the success that the gesture has since been repeated on an annual basis. Bookings are confined to a maximum of six but with the airport determined to ensure as many children as possible avail of the very special Christmas treat, a maximum of two adults will be allowed with any group of six. No child will be allowed on their own without an adult. Announcing the Santa Flights Matthew Thomas, CEO, Shannon Group said: “Any day when you have hundreds of young children pouring through the airport beaming with excitement at the prospect of getting to meet Santa high in the sky on board an aircraft is a day when you’re going to have a lot of fun. That magic begins for children on arrival, with characters from their favourite cartoons on hand to welcome the special guests as the transit lounge is transformed into a winter playground. There will be a disco, elves, a puppet show, face painting and plenty of other fun and games.